Here I’ve assembled a few of what I call “personal postcards”—a record of recent travels for researching Dreamboat, The Parisian Affair, and The Greek Villa, as well as some interesting stops along the way, which I want to share with you. 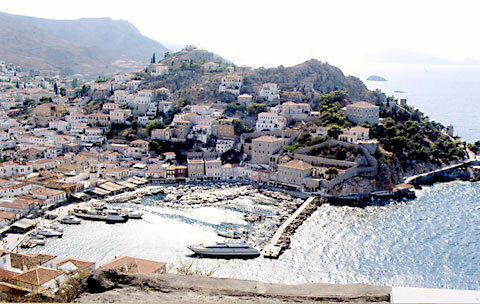 Water, Water, Everywhere But Not a Drop to Drink: Ironically, Hydra, one of my favorite Greek islands, is named after that which it does not have: water. It has to be brought in by tanker every day. Also, no vehicles are allowed. Not even a bicycle or a moped. 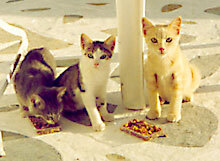 Three Little Kittens: They were all starving, so we fed them. But the one in the center was starved for more than food. It took all my resolve not to adopt it and bring it home, afraid that it would upset the marvelous balance of Billy, Jeffrey, and Mina. 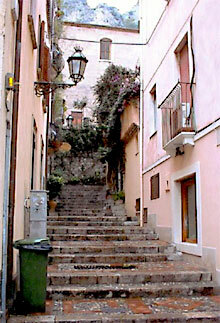 Taormina, Sicily: One of the most picturesque villages in Europe, I have Crissy tour the village on foot in Dreamboat, just as I did! 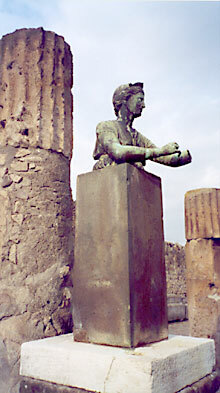 A Picture's Worth a Thousand Words: This bronze statue in Pompeii seems to be beseeching Vesuvius to stop erupting. 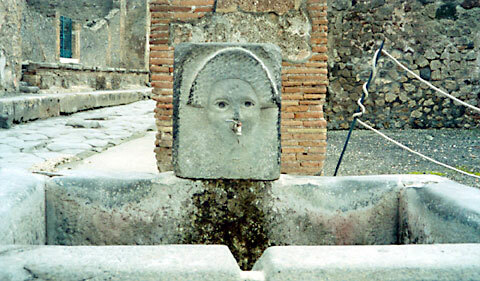 Silenced Water Music: This fountain, now dry, sums up the grandeur which Vesuvius turned into a mass graveyard. Most of the art and statuary has been moved to the museum in Naples. 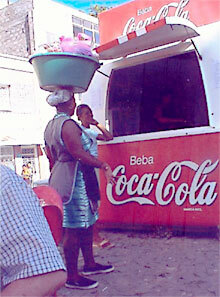 It's the Real Thing: But Cokes at this stand in the Cape Verde Islands came in old-fashioned, glass-and-cap bottles and only cost 5 cents. One problem: lack of decent stores. Everything plastic and Made in China-including the laundry tub atop the woman's head! 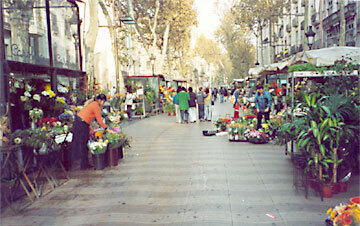 Taking a Ramble: Barcelona's famous pedestrian avenue, La Rambla, in the morning. It was lined with vendors' stalls selling everything from fresh flowers to pet parakeets, newspapers and magazines to food. To either side were some of the most beautiful buildings I've ever seen in my life. 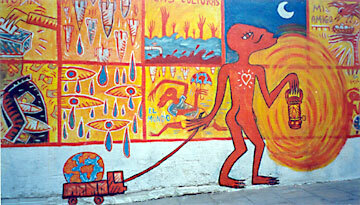 The Catalan Spirit is Alive and Well and Living in Barcelona: In this city, where you can't escape Picasso, Miro, Dali, or Gaudi, even graffiti (which I generally hate) are works of art. I'd hang this on my wall any day! Clear the Decks: This rather rough spell on the open Atlantic caused quite a bit of queasiness and broken dishes, and was the inspiration for Crissy going to see the ship's doctor in Dreamboat. Cannons from a Colonial Past: This fort on the Amazon River at Belèm, dates back from when Brazil was a Portugese colony. 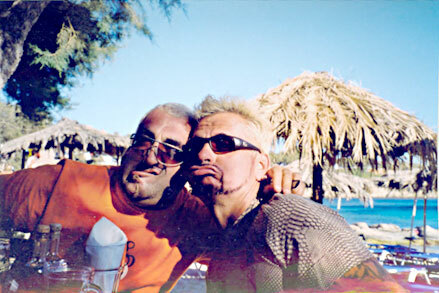 Clowning Around: Nick mugging on the beach with Tony “the Clown” Montana, an international renowned performance artist, during a stop on his World Tour. I’m so glad I could share these snapshots with you, and hope they’ll help you visualize Dreamboat as you read it, or else provide you with inspiration to travel. I know there’s still so much even I haven’t seen—and believe you me, I’m well aware of how blessed I am that researching a book can be as pleasant an undertaking as making a transAtlantic crossing.